Estimates are a simple way for your clients to pre-approve the basic scope and costs of smaller projects. Typically sent to your clients before you do the actual work, estimates are ideal for quick jobs, as an add-on to an existing project, for follow-up work, or for formalizing a verbal agreement. Let’s say you just had a phone call with your client and they’re interested in getting a quick cost estimate for a small project. The scope of this work doesn’t require a large, formal proposal. An estimate is the perfect fit. 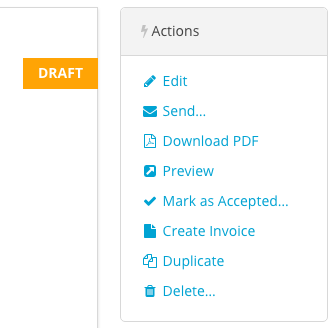 When viewing the main Invoices section of Harpoon you’ll notice a “Estimates” link in the sub-navigation bar. This link will take you to your Estimates screen. 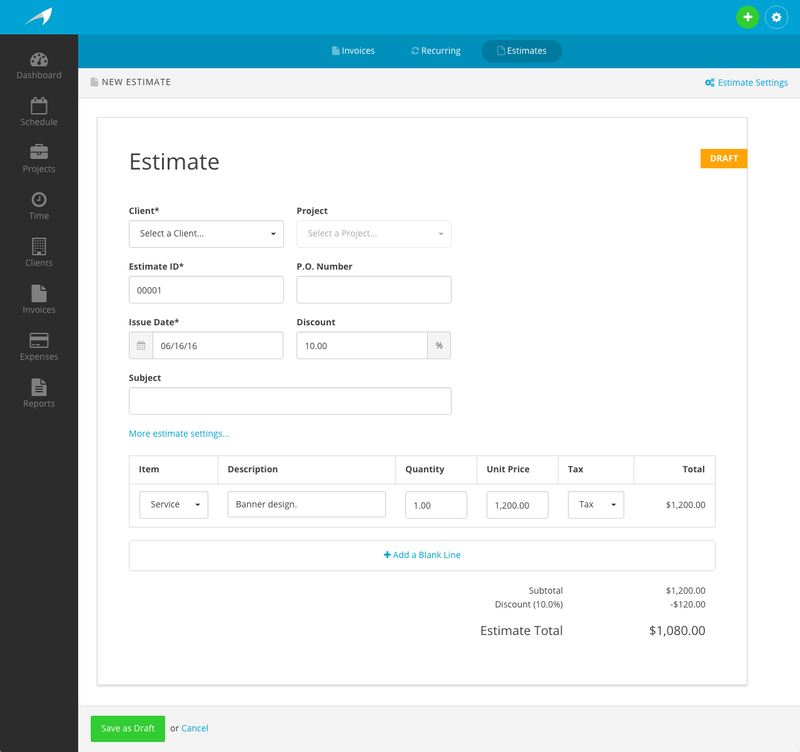 From here you can create, edit, and manage your estimates. Click the “Create New Estimate” link and you’ll be taken to the “New Estimate” screen. Filling out the details of an estimate is very similar to that of an invoice. You’ll select a client and optional project, and create line items that describe the services, products, hours, etc. you’re providing your client along with the costs of those items. Save your estimate as a Draft and you’ll see a list of actions you can take on your estimate. Edit: Puts the estimate back into edit mode allowing you to make further changes. Send: Allows you to send the estimate to your client. Download PDF: Provides you with a PDF version of the estimate. Preview: See what the online version of the estimate looks like from your client’s point of view. Mark as Accepted: Manually mark the estimate as accepted by your client. Create Invoice: Create an invoice that borrows all its details from your estimate. Duplicate: Create a new estimate based on the originating estimate. Delete: Permanently delete the estimate from your account. 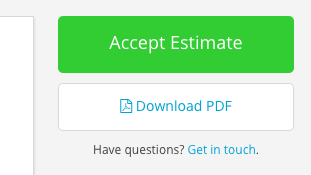 When your client views the estimate online they’ll have the option of “accepting” the estimate. If accepted the estimate will receive a new status of “Accepted” and Harpoon will notify you of the change in status. At this point you can use the “Create Invoice” action to create an invoice based on the accepted estimate to send to your client at the appropriate time, making it easy for them to provide payment.